Quicksilver promised delight from the new team of Philippa Ramon and Constance Clark, and while The Behemoth was a solid adventure, it didn’t have a lot of Flip/Constance sparkle. Well, The Middle has that in spades; it begins with Flip insisting that Constance’s thirty-fifth birthday will be celebrated with a “Wren party”, much to Constance’s suffering. 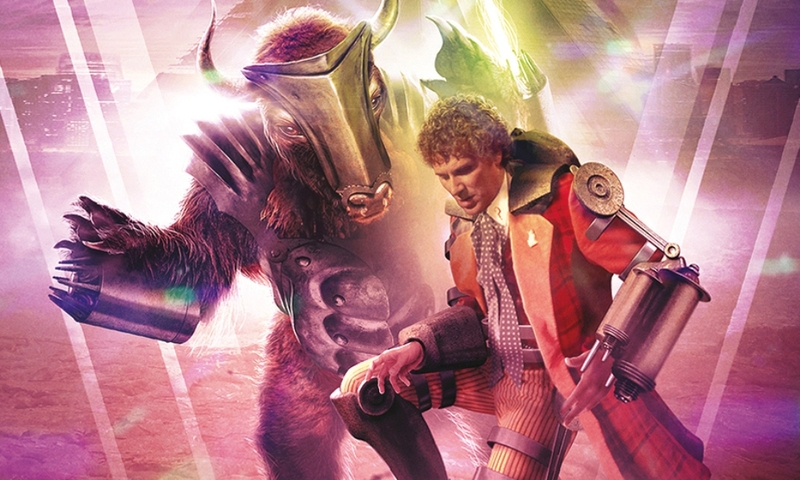 The Doctor stands back as a bemused elder guardian to these two young things — these days Colin Baker seems to play him as a cuddly grandfather more than anything else, but it works with this TARDIS team. This interplay brings out the best in both characters, who like to tweak each other — but as we see later in the story, they also have the utmost faith in each other. Even without that interaction, Chris Chapman’s script would distinguish itself for these characters; he just gets them in a way few of their writers have. The characters are split up in Part Two and follow their own strands, and it’s hard to imagine them just swapping roles, as Chapman does a good job emphasising their uniqueness. Constance takes charge of an office, and organises a fellow employee, while Flip bands together with youthful rebels. Constance is delightfully bossy as played by Miranda Raison, while Lisa Greenwood gets a number of good comedy moments as Flip; this story is probably the most I’ve ever liked her. Outside of the characters, this is a solid Doctor Who story. Some of the best Doctor Who stories are rip-offs; this one starts as “Doctor Who does Logan’s Run” but soon shifts into “Doctor Who does a contemporary SF novel I can’t name because of spoilers”. It’s something Doctor Who did a lot in the 1970s, and The Middle really plays with the sci-fi ideas in a way Big Finish rarely does on audio. The story does kind of run out of steam in Part Four, but it maintains energy until then, with a number of twists as we explore this alien environment and society. This is one of those stories with an exceptional set of guest characters, so I suppose kudos to director Jamie Anderson. Sheila Reid (Vengeance on Varos) is a delight as the strong-willed but elderly Janaiya, and I also enjoyed Wayne Forester in a double role that I did not even notice until it was revealed in the extras. The real standout, though, is Mark Heap as the Middleman, who gets just the right kind of villainous nonchalance down pat. As I said when reviewing Quicksilver, Big Finish struggled to make both Flip and Constance work on their own, but judging by The Middle, the combination is going down perfectly. The Middle (by Chris Chapman; starring Colin Baker, Lisa Greenwood, Miranda Raison) was released by Big Finish Productions in November 2017.